I've been itching to make one of these center step cards, which I've seen all over the place lately. I found a wonderful tutorial on Julie Davison's blog and followed her instructions. I came up with this Christmas version, using Delightful Decorations. I have to warn you, these are kind of addicting! I made several more, which I'll share soon. 'Bye for now! Love this cheerful card! Haven't tried making this style before, but you've inspired me to do so! 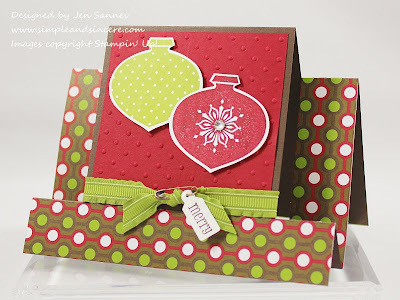 Love the fun dotted paper, too! Gorgeous! Love this style and the papers!